In China, they are called ‘smoke long’ since they can be read in the time it takes to smoke a cigarette. In Japan, they are called ‘palm of the hand’ stories which suggests they are about a paragraph or 200 words and the Swedish playwright, Strindberg published stories which told ‘a bit of human history on half a sheet of foolscap. In April this year, Newcastle Writers Festival hosted ‘Short And Sweet’, a panel discussion on this intriguing form which included Bronwyn Mehan, Richard Holt and Joanna Atherfold Finn. 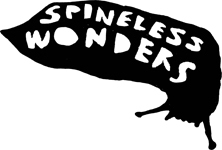 Sydney publisher, Bronwyn Mehan introduced the discussion by outlining some of the many names by which this micro form of writing goes by as well as by explaining why Spineless Wonders has settled on the term ‘Microlit’. Richard also spoke about ‘Flashing The Square.’ the collaborative video project which showcases his graphic design, microlit curated by Spineless Wonders and original musical compositions. Newcastle writer and teacher, Joanna Atherfold Finn reported on the inaugural Newcastle Writers Festival Microlit Competition, explaining what the judging panel had looked for and outlining the various ways that the theme of ‘Thresholds’ had been interpreted by the entrants. Videos based on the microlit texts from the four finalists – Amanda Berry’s, ‘Elbow Room’, Kelly Hawkins’ ‘Blue Light Disco’, Jodi Vial’s ‘Threshold’ and Karen Whitelaw’s ‘Koi’ – were screened at the end of the panel discussion. Karen Whitelaw won the $250 cash prize. A screenshot of the winning microlit is included below alongside the narration by Sydney actor Eleni Schumacher.